As important as medicine has always been to me, I fairly suddenly decided that I needed to do more traveling, always a desire that I had neglected. My health is excellent, but at the age of 53 I also realized that I was not going to live forever, and my state of good health in the future, as with everyone else on this planet, could never be assured or guaranteed for any period of time. My kind friends might say that I was undergoing a mid-life crisis, while my less loving associates would surely label it a post-mid-life crisis. My first destination was Colombia, South America. More specifically, Cali, Colombia. Yes, that's right, Cali. The same city that is known primarily in the United States as the number one city in the world for kidnapping gringos for profit and/or fun. Also, the same city that has cocaine literally sustaining it economically while at the same time destroying its very essence. There were many reasons I chose this destination, but they are not really pertinent to this newsletter. Suffice it to say that every member of my immediate family, as well as numerous close friends, exhorted me to control my seeming sudden psychosis and go elsewhere or stay at home. I ignored all of these requests as gently and firmly as I could, agreeing to be fully appreciative of whatever prayers and novenas they chose to say on behalf of my welfare and safety. Colombia is truly a physically beautiful country, populated by persons possessed with predominantly good hearts and souls. I must haven taken hundreds of cab rides, and I never encountered one cabbie who wanted to negotiate for extra money. To the contrary, they followed strictly their meters. On more than one occasion, a cab driver called me back to the cab to give me a few hundred pesos (ten to fifteen cents) that I did not realize was owed to me. However, as advertised, it is not really very safe, and an outsider in Cali has to be steered to a limited number of locations where security is maintained at all times by uniformed guards casually strolling their beats with machine guns in hand. While this was disconcerting at first, it later proved to be much more a comforting than a horrifying sight. It was actually on my fourth (yes, fourth) visit to Cali that my emotions were ambushed as they have never been before. My office manager had been traveling with me on all of these visits as well, and we had decided on an earlier visit to try to establish a clinic in Cali that could easily administer intravenous vitamin C for a wide range of conditions. As a result, we had gradually been bringing with us small amounts of vitamin C powder that simply was not available there. We wanted to be equipped to treat ourselves as well as others. Then the unpredictable hit. I had already developed a good friendship with a lovely Latin gal from Cali. She gradually came to appreciate the potential that vitamin C had for treating a wide range of medical conditions, as she was quite fluent in English as well as her native Spanish. Because of this, she had discussed what I did with her mother at some length. Five days before I last left Cali, my friend asked me if I could try to help treat the daughter of her mother's best friend. I agreed readily, my office manager fixed up a bag of roughly 90 grams of sodium ascorbate in 500 cc of D5W, and away I went with my friend in one of Cali's some 15,000 ever-present taxicabs. What I saw when I arrived I will never forget. Profound poverty as I had never directly witnessed before. Watching a National Geographic television special and actually experiencing third world poverty are two very different things. I was initially afraid to get out of the cab, but my friend assured me that I would be safe, and I had faith in her judgment. When we finally gained access to my future patient through fairly secure but old rusted security gates, we had been eyed more than casually quite a bit by many curious neighbors. When I first saw my patient, a beautiful and petite, totally bedridden, 30 year-old Latina, I had to quickly leave the room as tears started welling up in my eyes. After practicing medicine for nearly 30 years and sadly watching numerous patients die, my emotions were as poorly composed as they had ever been in my life. My friend looked a little confused and asked me what the matter was. I simply told her that this patient was nearly dead from pulmonary embolism, and the moment of death could occur at any time. She was not comatose, but she was very weak with very labored breathing. At any moment another blood clot could break away from her tender and swollen legs and she would be another victim of traditional medicine. She was on Coumadin and was well anticoagulated. However, after having fever every day for 2 months in the hospital, the doctors basically gave up and sent her home to die. I suppose in the United States, they might have added heparin and let her die in the hospital rather than at home, but other than that, the care would have differed little. Within certain boundaries limited primarily by lack of money, the traditional medicine offered in third world countries closely parrots the traditional medicine practiced in the United States. After reviewing what limited medical information was available, my friend helped me in my translation of the medical records and my questioning of the patient. It appeared the patient had a mixed collagen vascular disease with Raynaud's phenomenon. At some point she developed deep venous thrombosis with pulmonary emboli. She also had a heart scan that indicated some degree of heart attack or other form of heart damage had taken place as well. Furthermore, she had a root canal in her front tooth and several of the largest mercury amalgam fillings in her molars that I had ever seen. Even as a physician who has saved many lives and perhaps lost more patients than he cares to admit, I have always hated being put in the position of playing God with anybody's life. However, certain circumstances sometimes dictate that whatever decision you make, proactive or otherwise, is going to save, possibly kill, or even have no effect on the patient. Vitamin C neutralizes Coumadin (a drug that thins the blood to help prevent existing clots from propagating or new clots from developing). 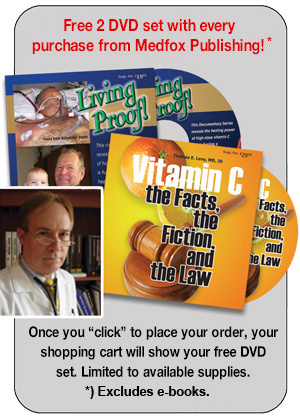 While I was certain that vitamin C would stimulate her immune system and normally promptly improve her condition, I had always been trained to never do anything to neutralize the blood-thinning effect of Coumadin in a patient with venous thromboses that could be threatening to travel to her lungs at any time and kill her. However, Coumadin just stabilizes blood clots, and the thinking (and hoping) is that the patient will then slowly stabilize and very gradually dissolve the blood clots without dislodging them suddenly in large obstructive clumps into the lungs via the venous blood system. Vitamin C, on the other hand, also promptly stabilizes and stops inflammation whenever a high enough concentration of it can be delivered. My clinical and scientific feeling was that ongoing, rampant inflammation was probably this patient's greatest threat to developing larger and potentially fatal blood clots that could possibly dislodge to her lungs and kill her. Somewhat reluctantly, but with guarded optimism, I started the IV. Divine intervention must have helped, because she had some of the poorest veins I had ever seen, yet the needle somehow got into one on the first stick. She hardly flinched. My friend and I remained during the two to three hour IV infusion, which was fairly uneventful. The patient had not eaten solid food for a long time, sustaining herself primarily on Ensure. She could not sit up in bed without a large amount of help, and when she stood to urinate, family members had to support her entire weight and let her urinate directly into a pan at her feet. She was wearing tattered pajamas. I had never given this dose of vitamin C to anyone on Coumadin, so I had to know just how drastically this would affect her blood thinning. I requested that the family get another blood test the next morning. They said no problem, but that the patient would have to get on a bus and sit around in a clinic for several hours. I said to get the blood drawn at home, but they said that would cost 30,000 pesos (about 12 to 13 dollars USD). I supplied this money to them since the manipulation of the patient might have just killed her. The lab result the next day did verify that much of the anticoagulation had been reversed by the vitamin C, so I temporarily (without further laboratory testing) increased her Coumadin intake for the next few days. The next afternoon my friend and I returned to give another IV. I cried again, but this time for joy. Our patient was sitting up in bed, wearing normal and pretty clothes, combing her hair, and able to rapidly walk across the room to go to the bathroom. She had just come back from taking a shower. Her mother said she was free of fever for the first time in two months. She also ate a normal and well-balanced meal for the first time in recent memory. She also complained bitterly about being stuck again for the IV, a sure sign of recovery. The third IV day was a plateau day for improvement, and the fourth day the patient was grinning with a smile that seemed to extend from one ear to the other. Her soreness in her legs had steadily resolved from the time of the first IV. I carefully went over nutrition, the urgent need for amalgam and root canal removal as soon as she is eventually taken off of Coumadin by her doctors, and I left her with enough vitamin C powder for several months of supplementation at about 2,000 mg daily, a practical although suboptimal dose. I advised the family to keep her on the dose of Coumadin that she had been on when I first saw her and to check her blood thinning in another week. I also gave advice on some simple and inexpensive other forms of vitamin and mineral supplementation that could be obtained on a repeated basis in the drugstores in their country. On the last day, after the fourth bag of vitamin C by vein, the patient's mother treated my friend and I to a traditional Colombian Sunday afternoon feast. Rarely have I eaten so well. I couldn't begin to describe everything that was in it, except that it was the best meal I had eaten in all four of my visits to Cali. Along with her daughter's positive clinical response, it represented more than a generous payment to me for the efforts of my friend and I for the treatments we had given. Although the patient has continued to improve, I have no doubts that another 7 to 10 days of intravenous vitamin C would have been greatly appreciated by this patient's healing body and further accelerated her recovery from this acute/chronic health crisis. An important addendum: I am NOT advocating ever treating established deep venous thrombosis with only vitamin C. Heparin and/or Coumadin anticoagulation should still be used in their usual protocols. However, I would advise strongly considering treating the patient vigorously with oral and intravenous vitamin C as well, making sure by frequent blood testing that the prothrombin time and INR are in the established acceptable ranges of anticoagulation for this potentially and often lethal condition. Copyright © 2004 by Thomas E. Levy, M.D., J.D.